The Daily Word.....an inspirational daily vitamin! Receive daily spiritual inspiration, insight, and encouragement through Daily Word! Each month this magazine offers daily spiritual inspiration and practical help through positive affirmations, inspirational stories, Bible verses and guiding thoughts. 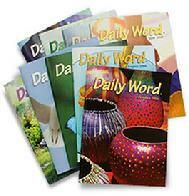 No matter what faith you are, Daily Word is designed to support you on your spiritual path. You will also enjoy thought-provoking articles by a variety of writers including celebrities like Wayne Dyer, Naomi Judd, Mark Victor Hansen, Wally Amos and Thomas Moore who provide inspiration, insight, and enjoyment in every issue. The Unity Online Radio Network is a platform for spiritual and New Thought discussions. Programs on the network are a powerful voice in providing the consciousness, clarity and common vision necessary to create transformation in the world today. We call it The Voice of an Awakening World. Listeners can tune in around the clock to hear provocative, uplifting and inspiring programs on topics ranging from what Jesus really taught to how to maintain a spiritual practice with your partner or spouse. The programming schedule offers something for everyone and features more than 36 new program episodes each week, 33 of them broadcast live, allowing listeners to call in and participate in the discussion. The programs are hosted by Unity ministers, licensed Unity teachers and other leaders from within and around the New Thought movement. The guests on some programs are among today's most insightful leaders from around world including Eckhart Tolle, Deepak Chopra, Michael Beckwith, Lynne Twist and Gregg Braden. Unity FM also features some of the best New Thought music daily during the Unity Music Hour and on Sunday, the New Thought Music Day.